The Topo table doesn't look like any other table because it isn't made like any other table. 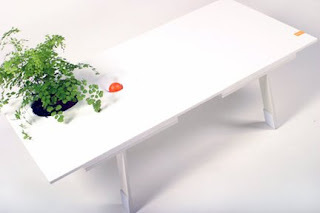 Topos are created using plastic inserts formed over rocks that are dropped into the table. Each one is made to order after you decide how you want it laid out. The coffee table version is $2,300, and you'll need to add $700 for the small version and $1,200 for the large (at least that includes ground shipping). If you're wondering, they're made out of corian, styrene and powder coated steel. I always looks for something different & unique & this one is perfectly fit for my requirement !! The table is so simple yet very exquisite! Love its color too! amazing. mona. lisa. laptop. artwork.